JD.com (京东商城) is a site similar to Amazon. In China, it is known as one of the largest business to consumer sites a direct competitor to Alibaba. They sell just about everything and their prices are competitive with Amazon.com.cn, which personally I prefer. Lots of people use JD.com so try them out and figure out which one you prefer! 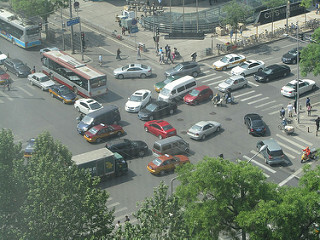 City planners in Beijing don't seem to get the concept of the "bottleneck." Personally, I learned about this concept in business school for project management, finding what in a process is slowing things down, or causing delay, essentially limiting production. They don't seem to get that here, lots of lots of bottlenecks are what make Beijing traffic known for being bad. Here is a video that was taken over golden week, which is a major holiday in China, in October, second largest holiday behind Chinese New Year. This is what happens when everyone tries to drive back into town and gets hit at the toll booth. What made me laugh the most about this video isn't the video itself but the fact that from up high it actually looks much more organized than it is in real life. Traffic rules do not apply, each man or himself. I've been wanting to write a good blog post about Beijing traffic for a while. It really is one of those things you can't really understand unless you've been stuck in the middle of an intersection in traffic trying to go 500 feet for 20 minutes. In my last blog post about parking (What's Wrong With This Picture?) you got to see some of the fun parking jobs in the city. Now, I want to share a blog post I read a while ago that really made me laugh and shows the amazing truth behind driving in Beijing, "the traffic light." 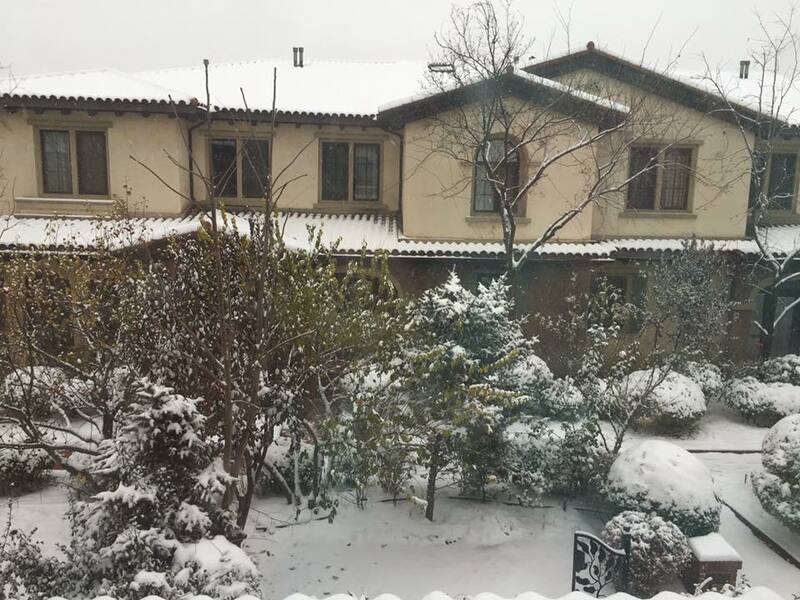 This past weekend we had the most snow I've ever seen in Beijing. 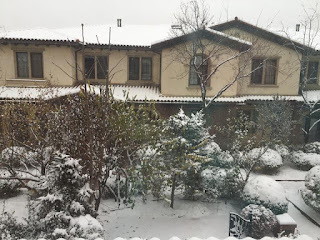 It snowed a lot of the weekend. No salt trucks, no snow plows, and lots of people uncomfortably trying to drive not used to snow. Pleco Chinese Dictionary is a must have app, when you are out and about, especially if you speak no Chinese. I use this now for words I don't know in Chinese or if I have someone that doesn't understand me. I also use the pinyin and character stroke keyboards to help me translate words I don't understand in other places. Pleco is worth the money! Edited to add: Realize once you move here that Google Translate will not work unless you are using a VPN. When in a bind and needing a translation the last thing you want to do is try to get a vpn up and running so you can use an app. Hubby sent me this picture the other day. "What's wrong with this picture," he says. I'm thinking that he's driving on the wrong side of the road. Nope. This car is parked, in the street, just like that, no driver. I wish I could say this is unusual, honestly it is the norm. I'm amazed how many cars double park, obviously this schmuck got left looking stupid as all the cars parked in the parking spots left. Today I finally got my new Baidu delivery app working. In my area, they deliver what looks to be a bunch of different things including groceries, but what I was interested in was the Starbucks delivery when I don't feel like or can't leave my house with the kids. For reference they deliver Starbucks, McDonald's, an Indian place at Central Park called Shalimar, Baskin Robins and about twenty million cake places out in the ShunYi area. I ordered a Venti Iced Caramel Macchiato with decaf coffee. Decaffeinated isn't a word here at least that I was able to find so I had to tell them I didn't want caffeine, in Chinese. Ordered, the phone rings, my ayi talks and asks if I want no caffeine or a little bit. I say no. One hour later the following arrives. This would be a no caffeine "coffee," otherwise known in the English world as milk with ice with some caramel on the top. OMG I about peed my pants I laughed so hard. Even my ayi knew how stupid a coffee with no coffee was but the guy couldn't get the idea. She went round and round on the phone explaining that a no caffeine coffee wasn't with no coffee. Long story short, I ended up getting my coffee with "a little bit of caffeine." I'm not really sure what I got but it did taste good and it wasn't white! local guy for where we parked. All part of the experience. right smack inside the 2nd north ring road was an experience. they had so many options. Worth a try!! If you are moving to Beijing or newly arrived one of the first apps you will want to download once you have your translation apps working is wechat. This is a Tencent product. Tencent is China's largest and most used Internet Service Portal according to the website. Wechat is like What'sApp, Facebook meets Instagram, Chinese style since Facebook and Instragram are banned here. My favorite feature is the group chat. Here in Beijing, I have group chats with friends, social groups, school groups, and more. I also use it to post about the kids and funny things I see here. One cool feature that I haven't used on WeChat is their PC version, so you can text message and post via your laptop or PC. Over the weekend the family decided to make the trek down to Sam's Club. China has been infiltrated by Walmart and Sam's Club, at least here in Beijing. Before anyone moving here gets too excited think Chinese version of Walmart. Yes it is an American company, but it isn't the same. So after our 45 minutes of driving we made it, signed up for 150RMB ($25) membership and in we go. I was excited to see it looked pretty much like Sam's in the U.S., TVs, camping equipment, aisles of products. Now of course there are differences, I don't think anyone in the world has as many cooking oil options as China, or rice choices. AND tanks of live fish for your eating pleasure. Otherwise I was happy to find some staples like Jiffy peanut better, Pampers diapers, Cetaphil wash, fresh produce that made it worth the drive. Sadly the traffic was so bad it took us 2 hours to make it home so I don't think I'll be driving back anytime soon. Screaming babies in the car, not fun. Luggage coming home for the U.S. this past summer for 5 people. 5 suitcases, 4 boxes, 1 stroller, 2 car seats and 3 kids. Gosh I love shopping and stocking up in the U.S. Diapers for twins for 4 months, check. Can't wait to do it again, NOT! Another nice weekend we went to Peter's Tex Mex which is in the Lido area, close to Rosedale Hotel and Lido Hotel. It was so nice we were able to sit outside. Chinese lady came in with her two dogs who then proceeded to sit down next to us. Thankful none of the kids are scared of dogs. Waiters and staff didn't bat an eye, as if this is totally normal? I love dogs but not dogs and dog hair while I'm eating my food. The waiter even brought the dogs water in bowls. Maybe this is more popular in big cities? I've seen a lot of crazy things with dogs in this city. Ironic as other parts of China eat dog and you can find it on the menu in some restaurants in town. Here is the approximate location of Peter's Tex Mex. Decent American food with lots of choices. Stay away from the dessert if you like sweets, while they look good they don't taste that good. My 2 cents. Winter has started early in Beijing. Last week we had a dusting of snow (hardly ever snows here) and while it was gone within 24hrs it has stayed unseasonably cold. Winter = smog because of all the coal and wood burning by China's utilities but also by the poor Chinese. We've been in a few weeks of bad smog, but nothing like poor Shenyang who is currently seeing values around 1400, 50x higher than the WHO suggests and in Beijing we're sitting 10x over the recommended value. I've barely left the house with the babies in 3 weeks. Here is a picture on our return from vacation in October, that's SMOG not fog and it is only around 200. Here I am on Taobao the other day and these funny dusting slippers come up as a suggested buy. I take a screen shot so I can post and laugh about the silly Chinese later on and lo and behold, what shows up on Facebook today??? Groupon selling almost identical ones. and over 10k bought. America, hold me. What are you people thinking???? Feel free to check them out and if anyone buys a pair, let me know if they actually work! Maybe I can put the kids to work if they have child sizes. That isn't against the law for child labor right? As with living anywhere in the world, life changes, nothing stays the same. I feel like most expats handle change better than the average population segment. So, what better for our family than expanding while abroad, right? We don't do anything easy. We have welcomed not one but two children into our family since we arrived in Beijing. Momma has had her hands full going from one child to three in two minutes, literally one minute I have two kids, a minute later I have three. More on my review of BJU (Beijing United Family Hospital) later, maybe once I've left Beijing. So, while I take pictures and come up with so many ideas for this blog, I just never seem to find 10 minutes to sit down and upload....write....post. I swear Beijing is still just as crazy and China is still a rollercoaster ride. I promise I'll try my best to keep you all entertained and informed. Out on my side of town is a large driving school. For a while I thought all these cars were some weird taxis, but once you see them driving it is pretty obvious from the crawling along and weird uncomfortable driving they are learning to drive. I guess they teach driving in mass, just like they do most things in China. I'm surprised they don't all crowd together in one car and take turns honestly. My suggestion, hire new teachers for the driving schools, the aren't putting out quality drivers in this city!! One of the first placed I always miss upon my return to Beijing is Chipotle. Avocado Tree is an OK replacement but just doesn't do it for me and the portion sizes are pretty small. If you haven't eaten Chipotle or don't like it, I feel sad for you. In comes Hffousa Taco, which is located at Indigo Mall (18 Jiuxianqiao Rd, Chaoyang, Beijing, China) for anyone local. We found the menu via Sherpa delivery and sent the driver with an order after confirming someone at the restaurant spoke and read English. It's a lot of work trying a new place via take out!! Little did I know how much Hffousa Taco was trying to be just like Chipotle. Sadly it wasn't anywhere near as good. Too spicy with the pico de gallo for my kiddo. Check out these pictures, look familiar? I'll stick with Avocado Tree for now, or the new place out in Shunyi, El Gran Bocado. I just now opened the very last piece of home that had been unopened from our container shipment and even moved within Beijing. A highchair. I've been busy, birthing babies in Beijing, but more on that later. I should have known better to leave a package unopened because guess what? I got a surprise! The movers had added some stuff into the packaging and I ended up finding lots of random odds and ends, a boppy (I'd just spent money to buy one secondhand), extension cords, baby toys (hubby had just bought more on a business trip), and crib sheets to name a few in addition to the highchair. Gotta love it!